Doryanthes palmeri is commonly called the giant spear lily. 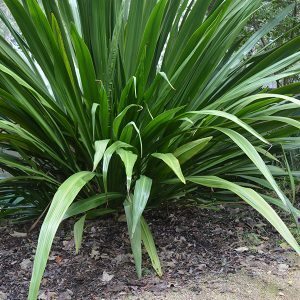 With large lance or spear shaped foliage and a very tall flower spike. The foliage itself is fairly upright in habit, the plant clump forming. The flower head towers above the foliage, usually bending under the weight of the flowers themselves when in full bloom. Foliage will reach 2 to 3 metres in height which makes this a wonderful feature plant with strong architectural lines. The foliage has more of an upright habit in full sun and does tend to be a little lax in shade. 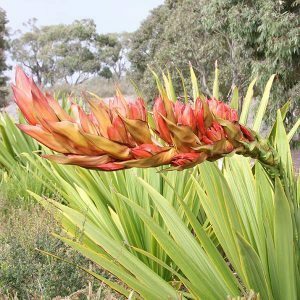 Best grown in full sun, Doryanthes palmeri is native to the coastal areas of souther Queensland. It will grow well as far south as Victoria as long as it is protected from frost and the soil is well drained. This is virtually a maintenance free plant, the only pruning required is removal of the spent flower spike. Flowering period is in early summer and from seed to flowering will take around 12 – 15 years. In good soil, little fertiliser will be required. Propagation is by division of established clumps or from seed. Seed may need to fire or smoke treated to improve germination. It can also be soaked overnight in lukewarm water.